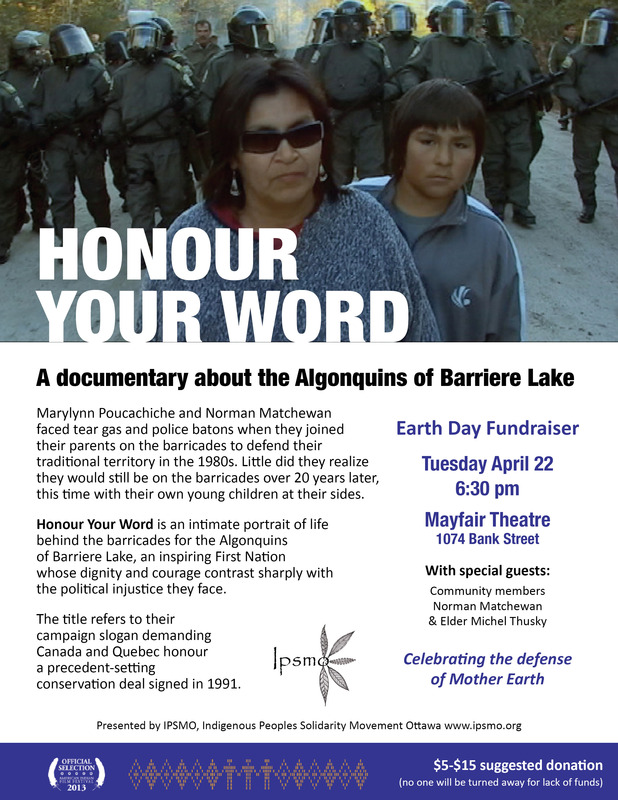 The documentary “Honour Your Word” to me, is a call for Canada’s citizens to go on the march in defence of the sacredness Canadians claim to place on the threads which connect the hearts and souls of all the good people who populate this great land. Watch the film and if, after doing so, you are not motivated to help make things right in La Verendrye Park where justice has been drawn, quartered and burned at the stake, then you are as spiritless as the perpetrators of the human rights violations taking place there today. The Algonquins of Barriere Lake are standing alone against tyranny and oppression. They are a brave resourceful people living in Third World poverty whose plight is documented in a film produced and directed by Martha Stiegman. Where is the mirror that would show Canadians what really is looking back at them when they peer into it? It does exist, but most of us (Canadians) will have to wait until death carries them to a new world to see it. The ugliness of their ways will be revealed and an accounting of some kind will surely come to pass at that time. We, the First Peoples, live in a world where only the human rights violations directly impacting settlers or injustices being perpetrated against people in far off countries like China or the Middle East are worthy of Canadians’ support and sympathy. When human rights violations are occurring against the Aboriginal People of this land, Canadians turn a blind eye and a deaf ear to it. Canadians need to ask themselves why this is so. To me, the answer begins and ends with ‘greed’. “Honour”, the real definition of that word does not exist in our Parliaments only because Canadians do not demand it as a trait alive and strong, in the men and women we send to the Red Chamber to represent us before the world and before God. We must ask ourselves how our children and their children will be impacted by our negligence of duty to them when we do such a thing. Surely we doom them (our children) to a world where dog eats dog, where the weak are spat upon and where peaceful protest is laughed at and ignored. The film is interesting throughout but several powerful scenes stand out to me as highlights. One scene is particularly moving, it shows a young Barriere Lake Algonquin man standing before the camera telling about what is being lost of his beloved land when clear-cutting occurs. His words are strong and heartfelt, he is overcome with emotion and though weeping almost uncontrollably, he finishes his statement. I wept with him while sitting in the darkness of the theatre and cannot banish the scene from my mind. It will be my inspiration and motivation to get involved and help with this cause in whatever way the Algonquins ask of me. One thing the film makes clear to me at least, is that the peaceful protest of the Algonquins up to this point, is nothing more than an exercise in pointless frustration. They protest peacefully to protect the trees and their way of life. Their leaders are thrown in jail when they do so. “Next time you will not be jailed for short periods of time but for years,” they are warned by the courts. Knowledge of such injustices and oppression makes my heart sick. What is happening in La Verendrye Park is proof positive of just how racist a country Canada is. Only a people who are capable of raw, unadulterated hatred against a segment of the community not their own would allow what is happening to the Algonquins of Barriere Lake to occur in a country like Canada. God help us. This entry was posted in Community, Idle No More and tagged Aboriginal, activism, Agreement, Albert Dumont, Algonquins of Barriere Lake, Canada, clear cutting, Community, Documentary, environment, film, Forest, Honour Your Word, injustice, justice, La Verendrye Park, language, logging, Martha Stiegman, movie, Oppression, Ottawa, quebec, Resources, Review, solidarity, South Wind, Trilateral. Bookmark the permalink.